Since first opening in December 2008, Golf City Sports has striven for permanently low and competitive prices, along with a strong quality ethic and, very importantly, listening to our clients’ needs. The shop is always well stocked with everything you’ll need for a day on the course and carries a wide range of clubs and hardware, clothing and golf fashions, accessories and whole lot more. 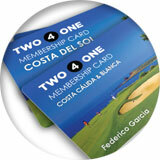 The Two-4-One Membership Card is the best way to save money playing golf on the Costa del Sol. It offers you half-price* green fees at over 80 golf courses, right along southern Spain. along with a strong quality ethic and, very importantly, listening to our clients’ needs. In November 2016, Mario Luca, a Fully Qualified PGA Professional, became the new owner of Golf City. and will go out of his way to help you get more enjoyment from your golf! Shop Opening Hours - Monday to Friday: 10am to 7pm, Saturday: 10am to 3pm.